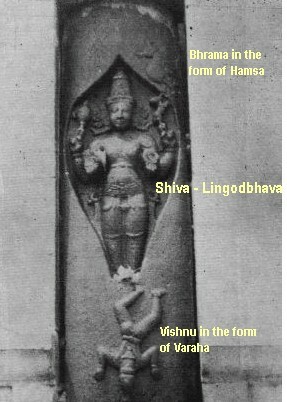 Lingodbhavamurthy is an iconic representation of Shiva, installed in the rear devakoshta (niche) of the garbagriha (sanctum) of all Shiva temples. The story of Lingodbhavar is that of the attempts of Vishnu and Bhrama to discover the origins (the beginning Aadi and the end Antha) of Shiva, as stated in three of the puranas - the Kurma Purana, the Vayu Purana and Shiva Purana. Vishnu was engaged in his yoganidhra - the slumber of yoga - at the end of a kalpa, in the waters of the great deluge, when there appeared before him, Bhrama emerging from a great illumination. Bhrama introduced himself to Vishnu as the Creator of the Universe, to which Vishnu replied that he was the architect of the Universe. An argument ensued between both as to their superiority over one another, when there appeared before them - a huge lingam of fire - with tongues of flames blazing out of it. Curious to trace the origins of this column of fire, Bhrama assumed the form of a swan and flew upwards, while Vishnu assumed the form of a boar, and burrowed down into the earth. Days of search in either direction proved futile, and hence the duo surrendered to this column of fire with prayers. Shiva then appeared out of this column of fiery lingam, with a thousand arms and legs, with the sun, moon and fire as his three eyes, bearing the pinaka bow, wearing the hide of an leephant, bearing the trishul, and addressed Vishnu and Bhrama in a thunderous voice, explaining that the two were born out of him, and that the three were then separated out into three different aspects of divinity. The non-anthropomorphic form Shivalingam is a representation of this infinite cosmic column of fire, whose origins were not tracable by Bhrama or Vishnu. The Shivalingam is the center of reverence and worship in all Saivite temples. The manifestation of Shiva in this column of fire in front of Bhrama and Vishnu, is carved in stone, as the Lingodbhavamurthy manifestation of Shiva, and is always enshrined in the rear niche of the sanctum enshring a Shivalingam. Since most temples face east, Lingodbhavar faces West. This legend described above is held at the vast Arunachaleswara temple complex at Tiruvannamalai, where the sacred Annamalai hill itself, is considered to be a manifestation of this cosmic column of fire. Tiruvannamalai, is one of the Pancha Bhoota Stalas, representing the primordial element fire. There is another interesting aspect to this legend. While Bhrama was flying upwards in the guise of a swan, he saw the petals of a ketaki flower drifting down. Tired by the futility of his efforts to reach the top of the mysterious column of fire, Bhrama requested the flower to acquiese to his lie that he had seen the top of the column where the flower had previously resided. Accompanied by his accomplice, Bhrama confronted Vishnu and asserted that he had indeed discovered the origin of the cosmic column. An enraged Shiva appeared out of the fiery column and cursed Bhrama so that he would not be worshipped in temples on earth. This legend relates to the fact that there are hardly any temples dedicated to Bhrama in India. There is a shrine to Bhrama at Uttamar Koyil in Tamilnadu, and Bhrama is also represented in the devakoshtas (niches) in Shiva temples; there are thus no Bhrama temples of any significance in India.